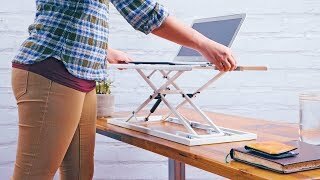 Why do I need a stand up desk converter? If you work at a fixed-height desk and would like to work at a sit-stand workstation, you have options. The E3 Compact Stand Up Desk Converter is a sleek and simple way to enjoy a standing desk, without requiring a major desk overhaul. Just set it on top of your current desk and get to adjusting! The E3 Compact Stand Up Desk Converter boasts an 11 pound weight capacity, which is enough weight to hold most laptops. Do I have a choice of color options? You bet! You can get your E3 Compact Stand Up Desk Converter in your pick of black or white. How does the converter work? Does it need electricity? Our E3 Compact Stand Up Desk Converter works by way of a built-in gas cylinder, so it doesn't need power to use it, and adjusts easily and without needing to mess with a lot of manual readjustments. Is this the only desktop converter you have? Not even close. UPLIFT Desk takes pride in bringing the best desk converter designs to you. We have a model for every person and every workstation. Let us help you find the right desk converter for you, whether it's the E3, the Adapt X, or the UPLIFT Riser or Clamp Desk Converters. With a little help from a desktop converter, we can get you working better - upright. What installation is needed for this? The E3 Compact Stand Up Desk Converter is easy to install. That's because there is no installation, all you have to do is set it on your current desktop and slide a tab to unlock it. Adjust to your preferred height and lock it into place. What's the best thing about the E3 Compact Stand Up Desk Converter? We love the E3 because it's one of the easiest and most affordable ways to outfit your current workstation for better ergonomics. The converter even saves space in your area and is less than 1 inch tall when closed, making it a suitable sit-stand solution for almost any table or desk. The E3 Compact Stand Up Desk Converter is made of solid steel and is available in two color choices - white or black. The sleek, compact design will sit atop your desk and is ready to pop-up whenever you wish to stand.